The number of women signing up for Mormon missions has nearly tripled since October 2012, when the Church of Jesus Christ of Latter-day Saints lowered its age requirement for female missionaries from 21 to 19. That change brought Mormon women closer to age parity with Mormon men, who can now be missionaries at age 18. The change is one sign of the “small but significant steps” that church leaders have recently taken to facilitate an expanding role for women inside the church, according to a New York Times article that followed up on an earlier extensive piece by the newspaper on Mormon women. Interest in women’s equality issues within Mormonism has grown both inside and outside LDS circles in recent years, and the Times articles come on the heels of a number of developments indicating that gender issues are receiving more attention among the all-male church leadership. Mormon men and women have been much more supportive of traditional gender roles than other Americans, according to a 2011 Pew Research Center survey. Nearly six-in-ten Mormons (58%) – including 56% of LDS women – say that marriage is more satisfying when the husband provides for the family and the wife takes care of the house and children. Only 30% of the U.S. general public shares this view. Last October, about 130 Mormon women demonstrated outside of a large meeting of the church’s all-male priesthood in Salt Lake City, demanding that LDS authorities allow them to be ordained. LDS leaders did not let the women into the meeting, but one LDS leader spoke of past “mistakes” by Mormon leaders and called for greater inclusiveness. A group called Ordain Women said it will try again to attend this year’s meeting on April 5. The Times’ article points out that while church leaders have made some efforts at change – for example, “inviting a woman to say a prayer at the church’s general conference, [and] revising the Sunday school curriculum so that females and males learn the same lessons” – ordaining women as priests would be altering doctrine, and is therefore unlikely. That may be fine with most Mormons, who show little support for fundamental changes in LDS gender roles, according to our survey. We found that 87% of all Mormons oppose allowing women to be ordained to the priesthood, with only 11% in favor of changing eligibility rules to include females. 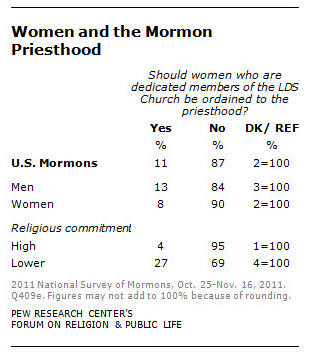 Among Mormon women, opposition is even higher than among men (84%), with 90% opposed to female priests and only 8% in favor.